The origins of the modern Kamado lies in the circular clay cooking ovens originating in India over 4,000 years ago. Around 3,000 years ago, they began appearing in China. It is believed that the Chinese brought these clay cooking pots to Japan approximately 1,700 years ago. This earthenware cooking vessel later evolved into Japan’s mushikamado (a round, charcoal-burning clay rice steamer with a removable, domed, clay lid found especially in Southern Japan).They usually included a damper and draft door to facilitate excellent control of heat. After WWII, the mushikamado came to the attention of Americans when US Air Force servicemen brought them back from Japan in transport planes. The clay was later replaced with ceramic for added durability and cast-iron for extra heat-retention. Eventually, “kamado” became a generic term for this style of ceramic grill. Manufacturing operations began in the Americas during the late 1960s. 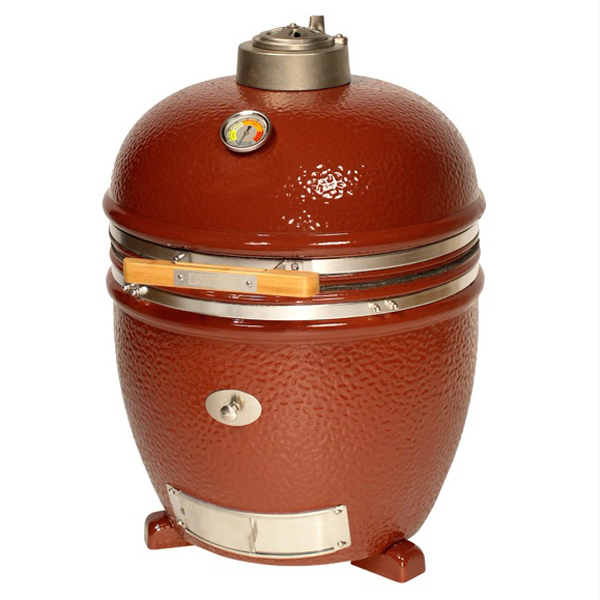 Compared to other types of grills, kamado grills only use approximately half of the amount of charcoal (some estimates claim kamado grills use only one quarter of the typical amount of charcoal). 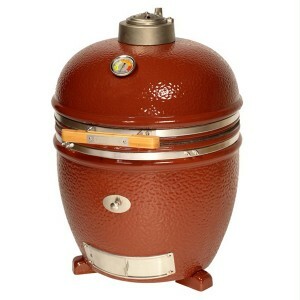 Kamado grills work well for grilling because of their capability of high temperature searing. They also make the best smokers because of their ease of use in regards to temperature regulation as well as their minimal charcoal consumption. Most kamado grills, however, are not capable of true 2-zone cooking. 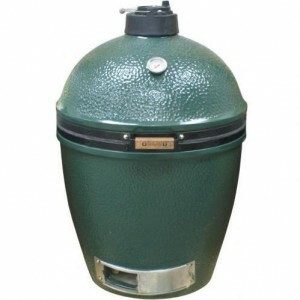 The Big Green Egg Company was founded in 1974 and quickly became the most popular mass-manufactured kamado grill. It has since become so popular that people often refer to kamado-style grills as “Egg style grills.” This brand makes a series of well-made, but basic, kamado grills with few accessories not offered by other companies. Saffire grills are easily the most versatile kamado grills and offer more accessories than most other manufacturers of kamado-style grills, improving control of the overall temperature and taste throughout the grilling/smoking experience. Draft controls precisely set the temperature and are also able to snuff the contained lump charcoal, which can be reused until it is entirely depleted. Wood chips can be fed into the grill without opening the lid through its wood chip slot. All of the metal is stainless steel except for the charcoal grate, which is cast iron. The grate is on a hinge so the user is able to easily add more charcoal or wood chips that are too large to fit in the optional wood chip slot. Ash can easily be removed through the lower air-intake slot. Like most kamado grills, the Saffire is unable to provide true 2-zone cooking, but an extra grate can be placed into the grill to double the size of the overall cooking area. A spring-loaded lid makes opening and closing the unit an easy task. Compared to the Big Green Egg, the Saffire Grill is heavier. This is because the Saffire Grill’s ceramic is approximately 1/4″ thicker. Thicker ceramic improves heat retention, and is a highly desirable trait in kamado-style grills. Pizza stones are available for the Saffire grill, transforming the grill/smoker into a top-quality pizza oven. While this grill is relatively expensive, it has the most advanced features in its class.